If you are in a hurry and want to find out quickly the results of our research, then we recommend Copper Fit Gloves as the best one. Have you been suffering from pain and swelling in one, or both, of your hands due to arthritis? Whether it's rheumatoid arthritis or osteoarthritis, there are many different types of treatments and therapies available, but one of the most simple and least invasive therapy is the use of gloves for arthritis. How do gloves help with arthritis? If you are unfamiliar with use of gloves for arthritis, this may seem a little weird at first. How can gloves help something happening on the inside of your body? Well, they work in a very similar manner to compression sleeves used for knee osteoarthritis, or really osteoarthritis of any joint in the body. This compression and therapeutic warmth can serve to decrease pain and swelling, and potentially enhance circulation to the hands, which can promote healing and pain management. This is similar to how wrist braces can help with conditions like carpal tunnel syndrome. However, like anything else that has proven successful in treating common ailments that can be quite debilitating, gloves for arthritis have become increasingly popular as of late. This means there is a huge variety to choose from, and making a choice can sometimes be overwhelming. Therefore, in this article, we would like to review our top picks for the best arthritis gloves currently available. IMAK arthritis gloves are the gold standard. They off mild compression with a breathable cotton/Lycra. Made of 88% copper nylon and 12% spandex, these gloves offer compression and warmth for pain relief. A cotton/spandex blend that offers mild compression and therapeutic warmth for pain relief. Easily washable with your normal clothes. These full finger arthritis gloves were developed by doctors and includes a doctor-written guide. 88% copper-infused nylon, 12% spandex. 10% of profits of to Arthritis Foundation. These high-quality arthritis gloves provide light compression. Crafted with care, they include GripTex technology on the outside for additional grip. These arthritis gloves offer soft compression and come in Men's and Women's sizes (differ in size and shape). Cotton/polyester/spandex blend. These are your standard open-finger copper compression gloves for arthritis. Soft compression, comfortable, and an anatomical fit. Nothing spectacular, but no blatant flaws. Open-finger design with 95% cotton and 5% spandex. Lower spandex content means gentle compression. These arthritis gloves are made with a higher proportion of nylon, and some find they retain heat a little more than others, which can be good for pain and stiffness. These are another version of full-finger copper fit arthritis gloves. Extremely versatile, these are great for working on the keyboard, or for more rigorous activities requiring grip. IMAK arthritis gloves are arguably the most popular currently on the market. They don't stand out for any one reason, but rather, they provide excellent value for a good all-around pair of arthritis gloves. They have caught the eye of the Arthritis Foundation, as IMAK has been awarded with the Arthritis Foundation's Ease of Use Commendation. The IMAK provide mild compression for relief of pain and swelling, and they also provide some therapeutic warmth, which can help promote circulation, ultimately reducing pain and promoting healing. Don't be too worried about the warmth, though. These gloves for arthritis are made of a breathable cotton material (92% cotton, 8% Spandex) that doesn't get too hot, so your hands shouldn't overheat in them. Pretty easy to use, just slip them on and you're done! They won't get in the way of the majority of activities, as they provide a tight form fit and they only go half-way up the fingers, so you can still grip and feel things like normal. They are also breathable and lightweight enough that you can wear them all day and all night if you wish. The only thing to be aware of is that they aren't meant to immobilize the hand joints or wrist at all, so they are made almost exclusively for arthritis of the hand, as opposed to other conditions like carpal tunnel syndrome. Overall, these are some of the best in the market, combining solid performance with a low cost, yielding the best possible value! They are comfortable and provide a nice level of compression and warmth without being too restrictive or hot. The are machine washable (cold water), so they can be thrown in with your normal laundry, just make sure to hang them up afterwards, or else they may shrink slightly and you'll have more compression than you bargained for! Copper gloves in general are becoming increasingly popular, as it is thought that copper-infused fabric is more effective than normal fabric for reducing joint pain, especially due to conditions like osteoarthritis. This exact effect is still up for debate in the science community, so we are cautious in saying the copper will help reduce pain, but there are some separate effects of the copper that many people could still find desirable. At this point, companies that make copper fit apparel usually talk about the copper's ability to reduce pain. Two recently-published studies, one in regards to rheumatoid arthritis and one focusing on osteoarthritis, and also some copper fit reviews indicated that copper alone likely doesn't provide any significant improvement in levels of pain and stiffness. However, some patients did report improvements, most of which are attributed to a general placebo effect, which in itself can be beneficial at times. It should also be noted that these patients wore bracelets or wrist straps, not full gloves. In any case, the compression offered alone is beneficial towards reducing joint pain and stiffness in your hands, and at the very least, the copper's antimicrobial properties are conveniently effective in eliminating the development of odors, so there is definitely some benefit to the copper-infused fabric. The palms come with a grippy surface, so you don't have to worry about anything slipping from your hands, and the half-finger design will still allow you to grip and feel objects in a normal manner. Overall, we have the mindset that the copper will mainly provide benefits in the anti-odor department, as opposed to having a huge effect on pain relief. That being said, the good level of compression and warmth will surely address the latter, all while being minimal in design and easy to wear. Just keep in mind the fingers are quite short (more like 1/4 than 1/2), so these gloves will be best suited for pain in the hand joints and wrist joints, but won't have an effect further up in the fingers. For simplicity sake, you can consider these Dr. Arthritis Copper Gloves to be very similar to the copper compression arthritis gloves we reviewed above, where the main difference is in the full length fingers. Dr.Arthritis offer mild-medium compression, and they are snug enough that you can still use your fingers for most common activities. For example, many customers are happy to learn they can still type on a keyboard with these. That being said, anything involving finer dexterity or a more sensitive touch may take some getting used to. These arthritis gloves are made with 88% copper-infused nylon and 12% Spandex. As we mentioned above, we're still a little skeptical about how much the copper fit contributes to pain relief, but nevertheless, its anti-microbial properties will help keep any odor away, which is a convenient feature. These are also interesting in that they come with a handbook containing information about arthritis, associated symptoms, as well as some hand exercises you can try to help improve your symptoms over the long term. Additionally, 10% of the profits go directly to the Arthritis Foundation, so you're contributing to research in this area in the process. Overall, these are excellent full-finger arthritis gloves that are well known to provide relief of pain and swelling in the hands and fingers. People with either osteoarthritis or rheumatoid arthritis can benefit from these. In particular, those in the early stages of osteoarthritis can use these to fend off the development of symptoms, and they're especially great for people who are in hands-on professions, or those who have hobbies requiring fine or heavy use of the hands and fingers. Thermoskin is one of the more high-end pairs. They offer some fancy features, but of course, this is associated with an increase in cost. While these are often classified as "half-finger", they are really more like a 3/4 finger glove. This has both advantages and disadvantages. If you want to be able to use the pads of your fingers, these can be a great option because they essentially cover as much of your fingers as possible, providing therapeutic warmth (and some compression), while still allowing the pads of your fingers to remain exposed. On the other hand, some customers with smaller hands (specifically, shorter fingers) find that they can be difficult to type on a keyboard with, as the fingers extend to the most distal finger joints. However, you can also find these gloves in a full-finger style, so that can be addressed. Otherwise, these arthritis gloves provide mild to moderate compression all over the hands and up part of the fingers, and a lot of people like them for the "Goldilocks" warmth they provide, that is, not too hot, not too cold. They can be worn for any amount of time, and are especially great to wear while sleeping if you're comfortable enough in them. Some customers have mentioned their hands are warm, and maybe a tiny bit sweaty, upon waking up in the morning, but not to a point where it's uncomfortable or affected their sleep. Lastly, these gloves are highly functional, as they provide a nice anatomical fit and aren't too thick, and they also come with a really good GripTex layer on the palms for enhanced grip. Overall, these are excellent gloves that are suitable for anyone with rheumatoid arthritis or osteoarthritis in their hands or fingers. They come at a steeper price, but they are very well-liked and incorporate a lot of nice features that can definitely make a difference. We especially like the nice balance between compression and warmth, and the GripTex palm works really well. The only downside is that the finger length can be a little awkward for those with short fingers, but this really just comes down to personal preference. They also come in a full-finger variety, so the latter can be easily addressed. These arthritis gloves are sometimes listed as being 100% nylon, but we suspect there is at least a small portion of Spandex involved, as they do provide a nice anatomical stretch fit. Based on the picture, these gloves appear to be less stretchy and more like gardening gloves, but don't let that fool you. They are stretchy and provide compression over the hand and fingers, and they are useful for relieving pain and swelling due to arthritis. Otherwise, these gloves don't differ too much from other arthritis gloves. The main features are there: elasticity for compression, and the moderate insulation for therapeutic warmth. When combined, these effects provide an optimal method to reduce arthritis symptoms. The one thing we're not too sure about is the durability. We haven't been able to put these gloves through the wringer, but the customer reviews regarding durability are certainly mixed. Some like them, some hate them, so we can't provide any helpful information on that front. If you do decide to go with these gloves, one thing to note is that there is a tag on the inside, which can be hard to see at first. This can potentially irritate your skin if it's not cut off prior to use. 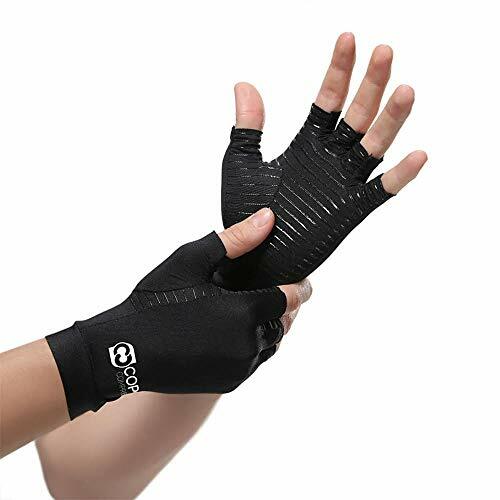 Overall, there are a few more question marks surrounding these gloves, but generally speaking, these types of Isotoner gloves are well-known to provide relief from pain and swelling while still allowing you to move your hands to your full capability. One thing we did notice on some of the customer reviews we've seen online is that people often self-diagnose their hand problems, and sometimes this is a wrong diagnosis. Just keep in mind when reading the reviews that you look for those with similar symptoms to you, as those will be the most relevant for your needs. Arthritis can occur in many of the body's joints, but some of the more common sites include ankles, knees, hips, elbows, wrist, hands, and fingers. Arthritis of the hands can be particularly debilitating simply because we use our hands for almost everything. Particularly, if arthritis is present in the fingers, even the lightest and most gentle tasks can be impossible. The two most common types of arthritis in the hand are rheumatoid arthritis and osteoarthritis. While gloves and braces often function to address either conditions, it may help to have a further understanding of what causes the pain and stiffness associated with each of these conditions, and how arthritis gloves can help. The video below provides a comparison of symptoms between rheumatoid arthritis and osteoarthritis. We will provide some more information after that, as well as general information about how gloves can help treat symptoms of arthritis. Rheumatoid arthritis is a form of arthritis that is caused by an immune response, meaning that it generally has nothing to do with injury or wear and tear of a joint. When two bones meet to form a joint, the ends of the bones that are in contact with each other are enclosed together in a synovial lining. In some people, the immune system will mistakenly attack cells in this synovial lining, which then causes inflammation, effectively making this synovial lining much thicker than it should be. The result? When this synovial lining becomes thickened, it basically pushes on all of the surrounding structures. There isn't much room in a joint to begin with, so eventually, this inflammation will cause damage to the bone, cartilage, or surrounding structures like ligaments. This, combined with the fact that the inflammation reduces the joint's ability to move (i.e. flex, extend, etc), is what causes the pain and inflammation. Rheumatoid arthritis of the hand can be particularly painful in the knuckle joints. The exact cause of rheumatoid arthritis itself has yet to be determined. There has been research into various viruses and bacteria that may influence the onset of the disease, but at this point, it seems more likely that genetics is the biggest factor. That being said, there do appear to be certain risk factors. For example, smoking and obesity seem to be linked to rheumatoid arthritis, and women, people over the age of 40, and those with a family history (the latter would tie into genetics) are also at a higher risk. Osteoarthritis is the wear and tear arthritis that you may have heard about previously. This form of arthritis is especially common in the hips, knees, and ankles, where gravity plays a bigger role and makes sure that those joints are constantly subjected to higher forces due to body weight. However, osteoarthritis can still happen in the hands, and any joints in the hands or fingers are fair game. As you may have guessed, the "wear-and-tear" classification of osteoarthritis indicates that its causes are rooted in physical damage. Whereas rheumatoid arthritis is basically the inflammation of the synovial lining, osteoarthritis is the physical breakdown and degradation of the actual cartilage that cushions the ends of bones. This is probably best visualized in the knee. If the cartilage that provides padding to the ends of the femur and tibia break down, you can end up with bone-on-bone contact, which can be extremely painful. This can also happen in the joints of the hands and fingers. Even though these areas typically aren't influenced too much by gravity and your associated body weight, moving damaged joints can be very painful, and as we know, hands and fingers are way more useful when you can move them! Osteoarthritis seems to be particularly common at the base of the thumb, in the wrist, as well as the fingers. The main carpal bones in your hand can also be affected, it's just slightly less likely. Those more prone to developing osteoarthritis in the hand are those in professions that require lots of repetitive and strenuous activities of the hands and fingers. For example, roughnecks who experience "tong hands" when putting in long shifts on the oil rigs could be at a higher risk than an occupation that doesn't require so much use of the hands. Having read our reviews above, you may have already figured out how most of these gloves function to reduce the pain and inflammation associated with arthritis. Typically, they all follow the same general guidelines, in that they provide compression and some level of therapeutic warmth. The compression provided by the gloves is effective at reducing pain, sometimes almost immediately, and when combined with a little bit of heat insulation, these gloves can also help address stiffness and swelling around the joints. Arthritis gloves can be worn day or night, as long as you are comfortable in them and they don't irritate your skin! Most are made with a blend of pretty standard fabrics like cotton and Spandex, so most people don't have any adverse effects. The one thing you do want to keep an eye on is finger length. This is where arthritis gloves tend to vary the most. If you have pain and stiffness in your fingers, then you will likely need at a design with at least a 1/2 finger cut, but for best results, you may want to consider a full-finger pair of gloves. One word of caution: arthritis gloves generally don't help to cure the actual conditions, but rather, provide enough relief from the pain and stiffness that you can go about your normal activities again. These positive effects may continue for a little bit after you stop using the gloves, but eventually, the same old pain and stiffness will return. For this reason, arthritis gloves are usually marketed towards temporary pain relief, or used in conjunction with some other more formal treatment in order to maximize the treatment results. Arthritis gloves are really "handy" items that most people with arthritis of the hands could benefit from wearing. They are designed to provide a slim and comfortable fit, while offering great benefits towards reductions in pain and inflammation. Most arthritic gloves are very affordable, which usually isn't the case for medical products, so they represent a really good natural and non-invasive way to help treat the symptoms of your arthritis.